Found in Festival Gardens, just to the south east of St Paul's Cathedral is a sculpture by Georg Ehrlich. 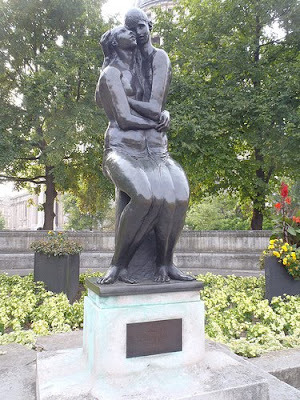 A celebration of young love, it shows two life-size bronze figures, both naked and seated side-by-side, with their arms around each other in an embrace. Though Ehrlich died in 1966, the Young Lovers was not erected until 1973, on a section of gardens laid out in 1951 by Sir Albert Richardson, as part of the Corporation of London's contribution to the Festival of Britain.